Best of the Week: Samsung 4K Blu-ray player, PMC Twenty5 speakers and more | What Hi-Fi? 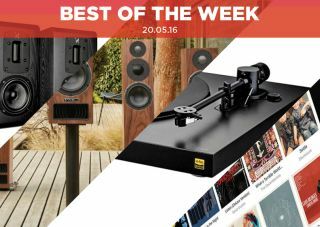 This week we heard news of a turntable with a built-in amplifier, Apple confirmed there's an issue with Apple Music/iTunes integration, and PMC unleashed a new range of speakers, the Twenty5 series. On the reviews front, we had the PS-HX500 turntable from Sony, which can 'rip' vinyl, the lovely S-1 compact speakers from Quad and the second 4K Blu-ray player to hit the market in the form of Samsung's UBD-K8500. What more can a turntable do? We've reviewed one that rips vinyl and another that's wireless. Now we have the G. Pinto On, which comes with valve preamplifier built in. Available in three power options (100W, 250W and 500W), the plinth and platter are made of Corian – a solid material used in kitchen and bathroom surfaces. The tonearm is made of carbon fibre and you can switch between moving magnet and moving coil cartridges. It's due to go on sale in July, with the cheapest option costing €2999 and the most expensive €4999. To commemorate the company's 25th anniversary, PMC has launched a new speaker range, the Twenty5 series. It's made up of two standmounters and three floorstanding models, all boasting PMC's new Laminair vent technology, which it is claimed, improves bass definition, timing and dynamics. The full Twenty5 range is expected to go on sale in the UK in June. In the last few weeks we've heard of a bug that plagues Apple Music's integration with iTunes. Apple has since confirmed that, yes; music is being deleted off the hard drive when users sign up to Apple Music. The problem appears to crop up when Apple Music matches music in its service with the files on your hard drive, but Apple stresses that this has occurred "in an extremely small number of cases". A forthcoming iTunes update is being prepared to resolve the issue, but in the meantime, we'd suggest double-checking your music library. "Anything that keeps vinyl fresh and appealing is gold in our eyes, and the PS-HX500 is a good example of that"
A turntable that can rip vinyl into hi-res files? This Sony record player is truly the gift that keeps giving. While the feature could be seen as a gimmick, it overcomes that with a lively performance and a big, spacious soundstage. The HX500 manages to keep things simple and convenient without getting itself in a muddle. For that alone, this is a very good buy. "The way the S-1s handle voices is, in a word, lovely. Two words? Seriously lovely"
A first glance at Quad's S-1s and we're already hooked. Better still, they sound as good they look. If you have a small room, these compact speakers would be a perfect fit. The sound they offer is detailed and precise, and it has a lovely way with vocals. They're not the most authoritative, but we don't think that's much of an issue here. These are speakers that really sing. "We don’t feel that this player gets the most out of our discs"
Panasonic set down an impressive marker with its 4K Blu-ray player. Could anyone surpass it? Samsung's UBD-K8500 is now out, and the answer is no, not yet. Picture-wise, it's a steady effort with some impressive clarity, but elsewhere it fails to meet the high standards set by the Panasonic. The audio performance lags behind, and a few odd design quirks (no display, for example), seal the deal for its rival. It's a fair effort for a first attempt, but we've come to expect more. Out of the two options, it's the more affordable, but not the most talented.